Springs Toledo is back with another collection of essays on boxing. Springs Toledo is back with another collection of essays on boxing. In 2014 his first collection, The Gods of War, was widely acclaimed. It has joined the ranks of boxing classics. With this latest collection, In The Cheap Seats, he has created another contender. I am not sure it will go on to winning a world title the way The Gods Of War did, but it certainly deserves a wide readership. 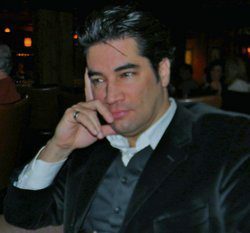 Many of the essays contained in this latest work by Mr. Toledo focus on more recent fights and fighters. Springs makes connections with the styles and personalities of past greats and those vying for greatness today. He does a fine job of this, but I have a hard time buying a lot of the comparisons. Maybe I am just old and cranky, but to me the glory days of boxing have long passed. While Springs does a wonderful job of linking the past with the present, he knows boxing history and understands the art, I sometimes found myself questioning if he truly believed what he was writing or was trying to convince himself as much as his readers about the quality of today’s sport. He points out how when Henry Armstrong held three world titles simultaneously there were only a total of eight recognized divisions. It is staggering to look back on that time with the competition Armstrong faced and comprehend his accomplishment. Springs has written about the proliferation of divisions and titles that exist today which makes having a multi belt holder nowhere near the challenge it was in Armstrong’s time, so I wonder why he felt if Floyd Mayweather had added a middleweight title to his array of belts it would have put him up there in stature with the great Henry Armstrong. I am not trying to take anything away from Floyd, but it is a very different sport now than it was in 1938. Again, maybe I am just too jaded to get excited about almost anything in today’s world of boxing. 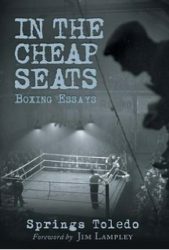 In The Cheap Seats has many other great essays contained between its covers. Mr. Toledo’s piece on Bruce Lee and the influence boxing had on him is fascinating to read. Mr. Toledo’s piece on Bruce Lee and the influence boxing had on him is fascinating to read.Not only does he explain how Lee adapted his martial arts style because of boxing, but, and here is where Springs’ knowledge of the fine points of the Sweet Science come into play, he explains the difference in defensive posture that gives a boxer the upper hand. It is essays like this that set him apart from so many of those who think they know the sport and try to write about the mechanics of boxing. I once remember a self appointed authority on boxing giving a lecture and telling the audience that it was impossible for a boxer to throw a double left hook. These pretenders should not be allowed to use up the perfectly good paper that could be utilized by writers like Springs Toledo. I found myself really getting into the rhythm of Toledo’s writing when he was recounting a conversation he had in Hyannis, MA with former welterweight contender George Maddox. Using the magic of his pen Springs captured the humanity of this wonderful man. I know George and what I read could only be compared to a fine portrait of him painted by a great artist. This is Springs at his best, describing the movements and words of an eighty-one year old former boxer who still takes great pride in his accomplishments. In just a few paragraphs you will come to know George Maddox. You will also feel the respect the author has for such men. It is beautiful stuff. There is much more to savor in this collection. In Where Have You Gone Harry Greb? you find out why the Pittsburgh Windmill is rated by Springs as the greatest pound for pound fighter ever. You get the inside scoop on the sparring sessions between Greb and Jack Dempsey that will lead you to seriously wonder if Harry could have taken the Manassa Mauler. I believe Springs thinks Harry could have done it. I think it would have been a great fight and a difficult one for Jack, but his strength would have won the battle. You’ll also get to read interesting pieces about how if boxing was more widely taught there could be less need for people to use guns. This subject is discussed in the context of the George Zimmerman and Trayvon Martin tragedy. Springs strips away the knee jerk emotions on all sides of the controversy and takes a measured look at how to prevent such things from happening. It is a refreshing piece to read in this age of media sensationalism. There is even a chapter devoted to the effects a vegetarian diet can have on punching power. Being a vegetarian myself it has made me want to get to the gym and test out my old left hook. Springs closes out his fine collection with a piece about Mae West and her connection with the boxing world. It is a very interesting piece about a one of a kind personality, and will go down as a classic. While I find it difficult to share Springs Toledo’s love of present day boxing, I do enjoy his writing. He is a throwback, an old school writer along the lines of A.J. Leibling whom he admires. Throw in a dash of Raymond Chandler and stir it up with Springs’ own unique style and you have a writer who leaves you wanting more. Many younger readers of these essays will be hearing about the greats of the past for the first time. I hope, and believe they will, be inspired to find out more about the rich history of this great sport.